With a new television series getting rave reviews, and a second film bringing in the dollars at the box office Sherlock Holmes is very much the hero of the hour. And if you feel like taking a trip to the Baker Street home of the famous detective there’s a wonderful little boutique hotel just around the corner which makes an ideal base from which to explore the world of Sherlock Homes. 10 Manchester Street has the rarest of qualities for a London location, a genuine feeling of peace and quiet and a sense of being removed from the relentless hustle and bustle of city life, while actually being just a short walk from not only the iconic address of 221b Baker Street, but also London’s numerous other attractions. With just 45 rooms 10 Manchester Street has a lovely friendly atmosphere and walking in feels more like walking into someone’s home than a hotel. There are a range of room options available, from petit doubles to an ultra-luxurious Grand Suite, all very stylish with Christian Guy furnishings. If you are staying during summer it is worth trying to bag one of the four rooms (all on the ground floor) which have a private garden terrace. 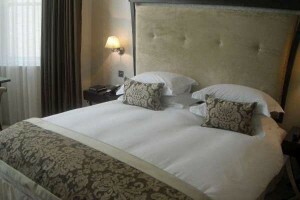 I stayed in a Junior Suite which was very spacious and had an enormous and extremely comfortable bed. As well as a living area there was also a small kitchen area which came equipped with a fridge, microwave and sink. I was only staying for one night so did not have the opportunity to make full use of all the facilities, but if you were staying for a few nights, or travelling with children, then the option of being able to prepare snacks and keep some cold drinks in a fridge could make a stay much easier and more pleasant. All the rooms have complimentary internet connection, something which I always appreciate but is all too often lacking in luxury hotels. 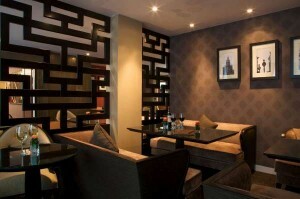 There is an excellent restaurant and the soft tones and low lighting creates a relaxed and intimate atmosphere, and a lounge bar with a good selection of wines, spirits and cocktails. Smokers can also make use of the cigar terrace and humidor. The hotel also holds regular cigar evenings with talks and drinks matching. Venturing out of the hotel, one of London’s most famous addresses, 221b Baker Street, with its Sherlock Holmes museum is just a short walk away. For more culture there are numerous museums within easy reach, including the British Museum, National Portrait Gallery, the Victoria and Albert and the Serpentine Gallery, and the theatre district is also not far. Many of the attractions are within walking distance, but Baker Street tube station is close by making the whole of the city easily accessible. For those seeking a bit of retail therapy, the high end, designer shops of Bond Street are just a five minute walk away and Marylebone High Street with its boutiques, bars and restaurants is just a stone’s throw away. There is such a range of accommodation to choose from in London choosing somewhere to stay can be difficult. But 10 Manchester Street offers something quite special. It is rare to find a hotel which offers such a tranquil location while still being in the heart of all that London has to offer. So next time you are visiting London and trying to decide where to stay the decision should be, well, elementary! Rooms at 10 Manchester Street start from around £125 a night. Visit the Sherlock Holmes Museum dedicated to the world’s most famous detective at 221b Baker Street.